The unusual Cape Barren Goose (Cereopsis novaehollandiae Latham 1801) is a bird belonging to the order of the Anseriforms (Anseriformes), to the family of the Anatids (Anatidae), subfamily of the Anserines (Anserinae), tribe of the Anserins (Anserini), and genus Cereopsis to which belongs as unique species with two subspecies: Cereopsis novaehollandiae novaehollandiae, Cereopsis novaehollandiae grisea. The epithet “cereopsis” has an etymology coming from the Greek “keros” = wax and from “opsis” = similar, because on of the characteristics of this bird is of having a waxy looking beak. The name of the species “novaehollandiae” is a genitive composed by “novae” and “hollandiae” and means “of New Holland”; this refers to the name given by the Dutch explorers in the first half of the seventeenth century to coast of southern Australia, erroneously considered as a desertic and little interesting island. 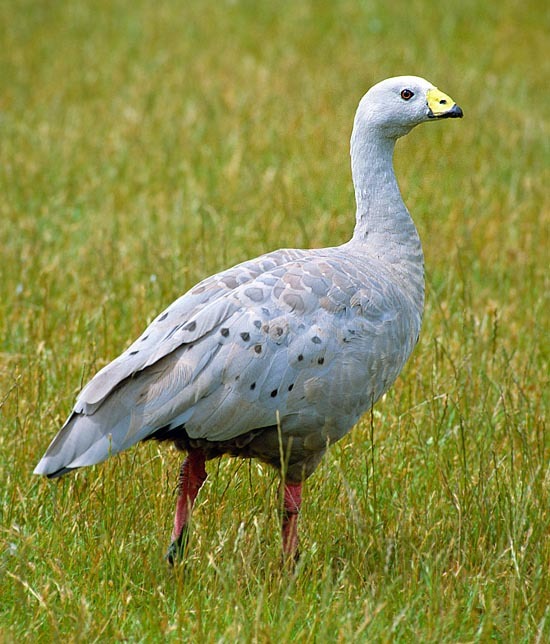 The Cape Barren Goose is native to the Australian continent where is present in the south-eastern part. It is also present in Tasmania and in the islands south of Australia. In the wild, it nidifies in the grassy spots or in the zones with brushwood on islands, frequenting also beaches and borders of lakes and lagoons. After the reproductive season, this species becomes partially errant especially when looking for pasturages on which it may feed; some subjects move from the islands to the coasts or the hinterland; vice versa, other individuals keep settled on the islands, occupying also those in open sea as they have the capacity to drink also the brackish-salty water. This wonderful goose has been subject of merciless persecutions by the local farmers because it does not disdain to graze nourishing in the cultivated areas. Before the end of the twentieth century, the species has undergone a drastic reduction. Presently, the population looks stabilized around the 15-20.000 individuals. In New Zealand, the species is extinct after an introduction done some decades ago. Luckily, some Australian islands, where the species nidifies regularly, have been included in natural reserves thus becoming protection oasis for the species itself. In Tasmania there is still the possibility to hunt it with limited concessions. The cape barren goose is 75-100 cm tall and has a weight varying from the 3 kg abundant to the7 and more; the females are usually smaller than the males. Males and females, even if having a similar phenotype, actually are easily distinguished, because the female emits an unmistakeable vocalization like a “pig”, that is, an extremely typical grunt. Conversely, the male produces a sound of the type: “qua-qua” more typical and similar to that emitted by other species of goose. This anatid, as is confirmed by its not fully palmate paws, does not love swimming. Usually, it enters the water only during the period of the moulting; moment when the anatids are particularly vulnerable for the predators as they loose the capacity of flying. Also during the breeding of the chicks it is easier it enters the water with the purpose of better protecting the juveniles themselves from the predatory menaces coming from the mainland. The plumage is of a nice homogeneous grey; the feathers covering the wing, at distal level, have a triangle-drop shaped drawing of a slightly darker grey. The same pattern, bigger and paler, is present in the scapular feathers at the level of the back. The remiges are for the half/third distal of black/slate grey colour, of the same colour are the tail feathers; the tail and the dark border on the wings are evident when the bird is flying. 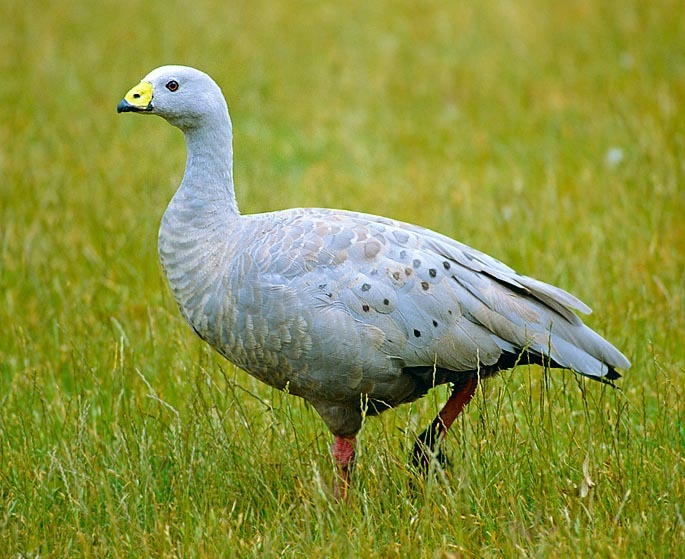 The cape barren goose has black short beak abundantly covered by the wax surrounding the nostrils and presenting the characteristic yellow-evidential green colour. The legs of this goose are strong, of a bright pink colour and end in a black oil coloured foot giving the appearance of a pink leg dipped, in a splashed way, in the distal part rightly in oil. The paws are partially palmate (in Germany, it is called goose-hen). The Cereopsis novaehollandiae grisea having the white spot, present on the top of the head, bigger than the white which extends up to the eyes does exist. This subspecies, or maybe simply population, is distributed in the Recherche Archipelago. Essentially vegetarian, it is a grazer nourishing of stems, leaves, seeds and tufts of spontaneous grasses and of aquatic plants. In our zones it reproduces during the winter period exactly as it happens in Australia (it has maintained the original season- ality). The cape barren goose is monogamous and the bond as a pair results being very strong; in autumn the pair becomes even more aggressive while protecting the territory where it will nidify. In Italy, the eggs are spawned by late December, early January, in number of 4-6 (rarely 7 or more) in a small depression of the ground; the nest is not much elaborated and is formed by small branches and other vegetal material collected near the nest itself. The interior of the nest is made comfortable, however, by the abundant down the female tears off even from her partner. Such down is essential for hiding the white eggs, during the deposition and for keeping the heat during the daily pauses the female does during the hatching period. The down succeeds in making the embryos to survive even if the temperature is very rigid seen that the hatching females do not renounce to pauses which may go on even for some hours (usually, in the morning). The eggs incubation lasts 32 days. The male does not hatch but contributes in defending tenaciously the female during such time, contributing then to the breeding and to the defence of the chicks. The eggs can be “candled” (procedure which allows verifying the fertility of the eggs by placing them close to a source of light with a particular technique in order to see the possible embryos against the light) very well even if the embryo develops very slowly during the first stages of the incubation; in particular it results being very small with a scarce development of the vascular network peripheral to it (commonly called “spider”) when it is hoped by the eighth-tenth day of incubation (stage of the hatching during which the candling is done to verify the fertility of the eggs). During this time the embryo is located in the obtuse hemisphere of the egg in an off centre position. In the Australian wild habitat, the cape barren goose spawns and breeds the chicks in autumn-winter (corresponding to our spring-summer) and the juveniles will be ready for the flying and the independency in spring.